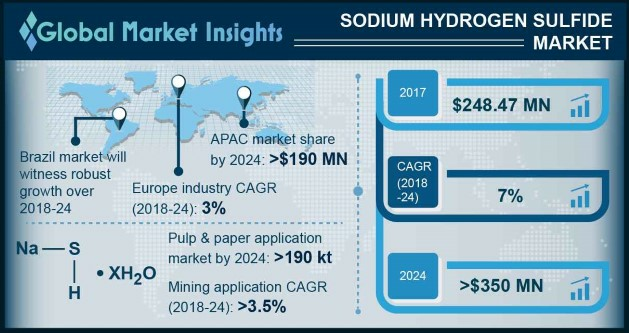 Sodium Hydrogen Sulfide Market size is set to surpass USD 350 million by 2024; according to a new research report by Global Market Insights, Inc.
Increasing development of low cost and less toxic chemical to replace harmful compounds like Sulphur is anticipated to favor sodium hydrogen sulfide market growth. High solubility, low toxicity along with low cost of processing will further propel product demand by 2024. Favorable government policies pertaining to control Sulphur emission may act as growth factor for the market owing to its feature to be used as an alternative to sulphur. Powder sodium hydrogen sulfide market size is anticipated to surpass USD 20 million by 2024, owing to its benefits in sulfurous acid dyeing in manmade fabrics. Expanding global textile industry owing to rising disposable income along with presence of numerous fashion brands will propel industry growth. China sodium hydrogen sulfide industry size from tanneries application is projected to surpass USD 25 million in the projected timeframe. Strong leather manufacturing industry in the region along with its usage in removing animal hair on hides and skin during leather processing is predicted to have a positive outlook on product demand. Enzymatic hair removal with sodium hydrosulfide and peroxide helps in effective tanning and offers improved strength & bonding properties of leather. Escalating leather goods demand owing to high living standards which has led to rising consumer spending on leather products mainly footwear, handbags and gloves will have encouraging impact on sodium hydrogen sulfide demand. High cost, low yield and risky production process may restrict industry profitability. The product can be obtained from hydrogen sulfide with a solution of sodium sulfide. However, high cost of sodium sulfide may affect sodium hydrogen sulfide market price trends. U.S. sodium hydrogen sulfide industry size from chemical processing application may witness significant gains up to 3% by 2024. NaHS can act as a reducing agent which can be used in Asinger reaction to manufacture thio compounds including thioamides, thiourea, thioglycolic acid, which are used in pharmaceuticals. Advantages in production process, easy handling, storage and easy to use properties along with growing pharma industry may favor regional growth. Swift growth in industrial sector and social revival initiatives by local governments globally is poised to witness high growth in chemical sector, which in turn may drive NaHS demand. Capacity expansion by local players in China and India along with growing leather and chemical industry in the region is likely to boost industry size. Purified grade sodium hydrogen sulfide market size is poised to witness significant gains of over 3% by 2024 owing to its application in research field due to its purity of more than 70%. Its usage in synthesis of organic intermediates and in preparation of auxiliary agent of sulfur dyes along with mounting demand in Kraft process as a makeup chemical is anticipated to favor industry size. Global sodium hydrogen sulfide market share is moderately consolidated with major players includes Genesis Energy, AkzoNobel, TCI Chemical, Solvay, Merck, Tessenderlo Group, Cayman, Prasol Chemicals, Chaitanya Chemicals and Henan Tianshui Chemical.